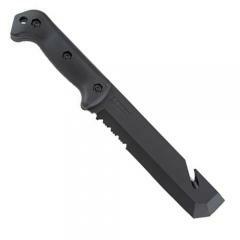 KA-BAR BK3 Becker TacTool FREE SHIPPING! Designed for maximum versatility, the Becker TacTool from KA-BAR is an entire tactical tool kit packed into one convenient package. The tool features a quarter-inch thick, 1095 Cro-Van stainless steel full-tang blade for a virtually bombproof construction ready to handle any and every job thrown its way. Fully lined with a razor-sharp edge, the TacTool can be used to hack and clear brush, or split wood when used in conjunction with a hammer. The sharp 15-degree angled edges slide easily beneath windows and between pieces of wood for use as a powerful pry. A steel pommel extends from the rear of the handle and is ideal for shattering glass windows. A seatbelt cutter and blade serrations further add to this powerful tool's versatile strength. A durable Kydex sheath is included for secure and reliable transport. ©2002-2019 CopsPlus.com: KA-BAR BK3 Becker TacTool FREE SHIPPING!